Howard Garrett provides advice on natural organic gardening and design, pet health, pest control and natural living. Calendar of Howard Garrett speaking engagements and appearances. Connect with Howard, friends and other people about natural organic living. Read and Subscribe to Howard's current eNewsletter. Weekly Dallas Morning News gardening column. List of Natural Organic Businesses & Products. The Dirt Doctor’s natural, organic Guides. Thousands of topics on natural organic gardening, plants, pests, diseases, pets, organic living and other information. Howard Garrett's RADIO PROGRAM will help you understand organics and the importance to your health and lifestyle. Listen LIVE, to a Podcast or on the Dirt Doctor App. Ask a question and get advice regarding natural organic gardening, landscaping, farming, pest control, trees, pet care, birds, food, nutrition and health. Helpful articles to improve your Health & Lifestyle. Planting, maintaining and solving issues with trees. 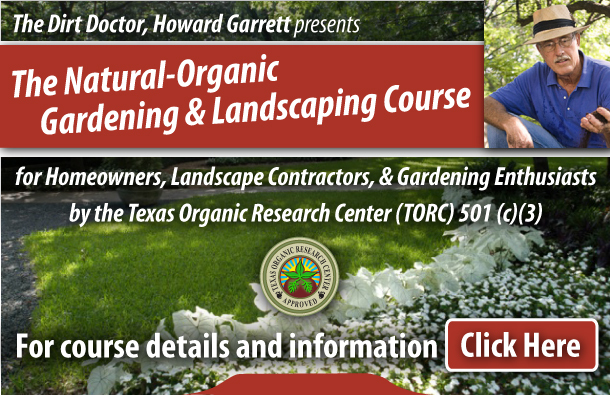 Howard Garrett is one of the leaders in the research, education and promotion of natural organic gardening, landscaping, pet health and pest control and how to enjoy a healthier lifestyle. Howard’s radio show can be heard LIVE from 8 - 11am CST on Sundays in over 200 markets across the nation. You can also hear daily commentaries on radio stations across the U.S. and his weekly radio show is replayed via podcasts and the Dirt Doctor App. You can also join Howard on Facebook, YouTube, events and the Forums. Howard’s natural organic program works better in every way.